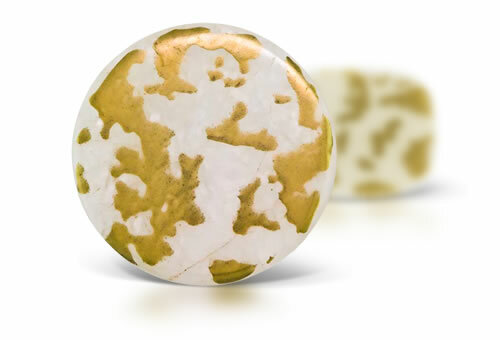 This unique gem begins as natural milky quartz, but is then treated to impregnate the stone's surface with a high karatage of gold. This results in a distinctively patterned, one-of-a-kind gem. RI must be taken on a white surface of the stone. CO2 or H2O inclusions that give the stone a milky appearance. Gold foil has been applied to the surface of the stone.